In our hyperconnected world, employees expect to work from anywhere, at any time and with any device. Each of these new access points, however, increases the IT security perimeter. In the flexible workplace, how can organizations balance the promise of greater productivity that increased access provides with the security concerns increased access creates? And how can they do it without wreaking havoc with the budget? The new, more accessible workplace needs to be, in a word, manageable. 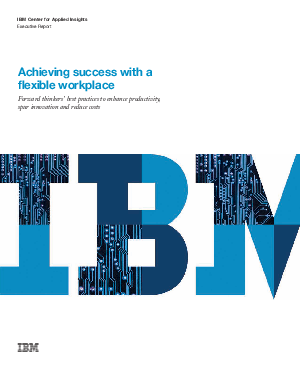 This IBM white paper examines how today's workplace can ultimately help create greater enterprise value and offers best practice for how to best harness a flexible workplace to improve the effectiveness and efficiency of enterprises and institutions.